Lots of free tools has been built till now that let you make your USB bootable. A bootable usb means enables you to install an OS, windows,linux directly from your usb. These tools are available numerous in number and take just a few moments of you to make your usb bootable. If you are still using the traditional CD for installing the Operating system on your computer then I will suggest you to leave it and try to install it from your usb. Installing OS either it is windows or Linux, is very easy and looks compatible from USB drive. The reason of suggesting you to make use of a bootable USB is that, CD disks are getting damaged fast and soon as compare to the USB flash drives. Also the CD disk remains un-use-able for other purposes after doing so while on the other hand, USB drives can be used for other purposes without any doubt. You can format the pen drive after installing the operating system on your computer and store your other data in it. Now here if you are looking for some tools that are free to download and can be used to make your usb bootable then here we are with the list of best among the tools available for free. There will be a short description in case of each & single tool so you will be easily pickup the one you think is the best for your work. It is a very simple and easy-to-use bootable USB creation tool. 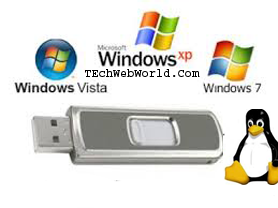 Using this tool you will be easily make a bootable usb drive for all windows versions including windows xp, 7 ,8 and linux distros. It features a very simple and user-friendly interface for creating a bootable USB. What you have to do is to download this little software from the link given below. After you have downloaded this file you can directly launch this without installing, once you clicked on the downloaded file, a window pop-ups which automatically scans for ports of your computer and if you have a USB connected, it will detect it. So Connect a USB before you run this program. And then Select a file system to use on USB flash drive. Give it a name and show the path to ‘bootable’.ISO image of your targeted operating system. One thing that is need to be sure that the ISO image on your hard disk is a valid is must because, before loading, rufus scans the image. Another best and small utility for making bootable usb is wintobootic. Just like the rufus, it also don’t require anything more than an ISO image and a usb is connected on your computer. It can also be run without installing on your pc. In order to make your USB bootable, you have to drag and drop .ISO image to the interface. And click on Do it button. The drawback of this tool is that it cannot be used for linux. This tool is specialized for installing linux from usb flash media’s. the name is universal but works only for linux. It has a list of most linux distributions from which you have to select one from the drop-down menu. After selecting a distribution it gives you a direct download link for the distribution to make a bootable usb drive, or if you already have an ISO file on your local disk, just browse it. It uses a simple interface. But may be non-experts may find it a bit difficult. So in today’s post we shared the list of best and free bootable usb creation tools. I hope you liked this post and the post was helpful for you. If you know about any other tool that you think is best than the above, then please let us know so we will add it to our list.